Indian opposition leader Rahul Gandhi has pledged to create "the world's largest minimum income scheme" if his party wins election. 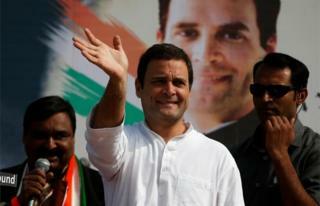 He said the Congress Party would guarantee an income for 50 million of India's poorest families. Mr Gandhi called it a "fiscally prudent" scheme that would "eliminate poverty". But the governing BJP said India's poor was receiving more support under existing schemes. "If you are sure about your defeat, you can promise [the] moon," party general secretary Ram Madhav tweeted. Congress had revealed a minimum income policy would be part of its election manifesto in January, but had not released details until Monday. Mr Gandhi said that the poorest 20% of Indian households would receive 72,000 rupees ($1050) yearly as part of the scheme, which is called Nyay (Justice). He said 50 million families - or 250 million people - would directly benefit. "The final assault on poverty has begun. We will wipe out poverty from the country," he said, adding that Congress had been advised by "many economists". The scheme could cost up to $52bn. French economist Thomas Piketty, noted for his work on income inequality, had been rumoured to be advising Congress on the scheme. But he told the BBC he had "not been directly involved in the design of this proposal". "But I certainly support all efforts to reduce income inequality in India, and especially to move away the political debate from caste-based political to class-based redistribution of income and wealth." Is India's middle class actually poor? There has been much discussion in recent years over whether India can introduce a Universal Basic Income (UBI) - a regular cash payment from the state for all or most citizens without any conditions. In 2017, the Indian government's economic survey suggested that a scheme benefitting 75% of the population could significantly reduce poverty. Such schemes have been trialled at small-scale all over the world, including in Finland, Kenya and the Netherlands. The Congress policy, while not a UBI, is seen as a limited version of such a scheme. The announcement is seen as a bid to fire up voters who will head to the polls in April and May, but economists have warned the policy will be hard to implement in a country as vast as India. It remains unclear what data would be used to determine eligibility for the Nyay scheme. There have been various estimates on the exact number of poor in India, and the counts have been mired in controversy. Mr Gandhi did not specify how the scheme would be funded. Finding the money to support tens of millions of families would require scrapping existing government subsidies on food and fertilisers, and removing certain tax incentives, economic commentator Vivek Kaul told the BBC. However such measures would be unpopular with wide swathes of the population. It has been estimated that a true UBI could cost India some 5% of its yearly gross domestic product. "This is a watered-down version and it's good that it's a watered-down version," Mr Kaul said. "At some level, you need to start small and see how you are going to finance it, and then see if you want to grow a little bigger." Some economists have voiced criticism of basic income schemes, saying they reduce the incentive to work. India already has more than 900 federally-funded welfare schemes, including cheap food, fertiliser subsidies, a rural jobs guarantee and student scholarships. But Congress has insisted its plan is workable. "A lot of thinking and working has gone into the income scheme," Praveen Chakravarty, head of the data analytics department of the Congress party, told the BBC in January. "It is fiscally doable without drastic reduction of existing welfare schemes."